It takes some courage and confidence to take one of the most beloved comic strips ever and reinvent it as a dark crime noir comic. Yet, David Pepose and Jorge Santiago, Jr. find a way to honor Bill Watterson's seminal work while creating a pulpy murder mystery that stands on its own. 'Calvin and Hobbes' follows the humorous antics of Calvin, a precocious, mischievous, and adventurous six-year-old boy, and Hobbes, his sardonic stuffed tiger. 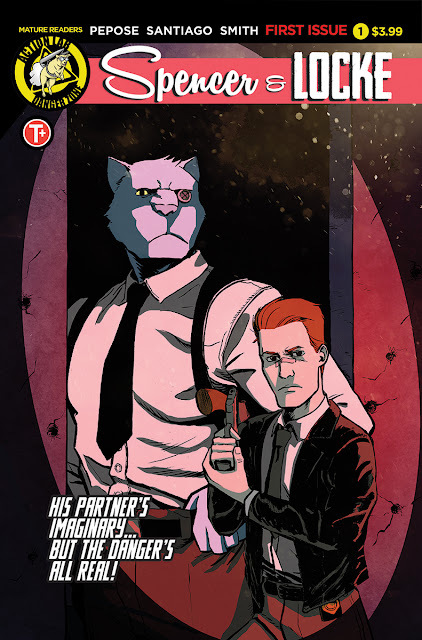 In that same vein, Spencer is a stuffed panther that Detective Locke carries with him, apparently unnoticed by others, and interacts with him as they investigate the murder of Locke's grade school love. Pepose walks a thin line between parody and drama but finds the perfect balance in tone and dialogue. The scenes with Spencer and Locke conversing are humorous but doesn't overstep the importance of the investigation. In fact, the story is dark and only lightened by Spencer's observations and the flashbacks but those too are melancholy considering the present day situation. Santiago shows a lot of versatility as he plunges the crime story in a gritty, grimy, urban landscape while occasionally brightening the darkness with very 'Calvin and Hobbes'-like strips flashing back to when Locke and the victim were kids. It's a great nod to Watterson but also adds some poignancy to her murder, fleshing her out a little. The rest of the time Santiago and colorist Jasen Smith establish a shadowy world made of purples, blues, lavenders, and reds. The noir aesthetic comes through from the first page creating the right atmosphere for this unique procedural. 'Spencer & Locke' took a risk, openly integrated the concept of a modern classic comic strip and it works. It just works. The 'what if' of a boy and his stuffed animal grew up to be a detective and his imaginary partner is executed without irony or played as a gimmick. It's a dark comedy that David Pepose lovingly portrays as a serious crime drama and it's irresistible. So far, Action Lab has another great title in their stable making this a must-buy.